Let’s talk about periods. It’s that time of the month when half of the world’s population bleeds, and we need to have a frank discussion about it. It isn’t gross. It’s not a “women’s issue,” and it certainty isn’t anything like that irksome, perplexing blue liquid you see on tampon and pad ads. People who menstruate need safe, comfortable ways to move through the world while on their cycles, and ignoring that fact out of discomfort or an imagined ick factor stands in the way of equality. From the tampon tax and the prohibitive cost of menstrual products, to women who face banishment during their periods or lack access to running water or private toilets – there are countless ways in which participation in society is restricted by the simple reality of regularly shedding one’s uterine lining. 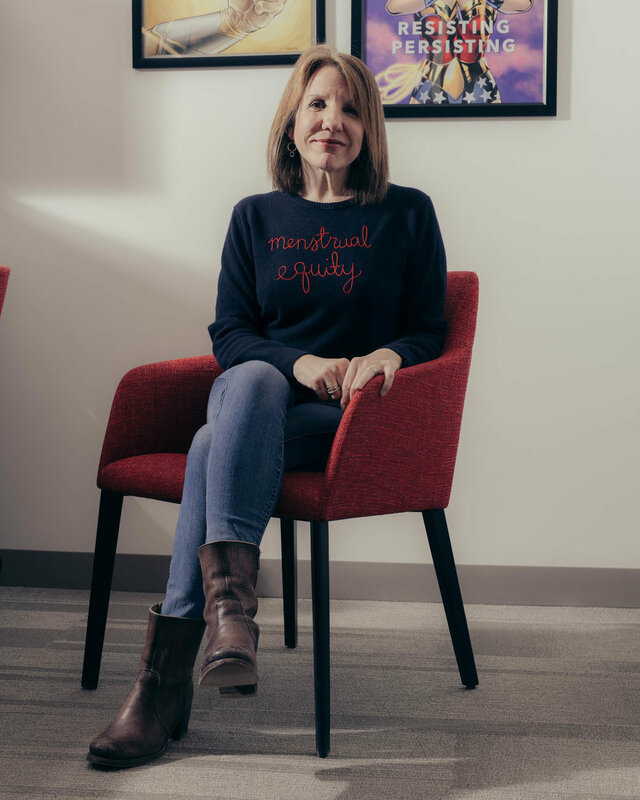 Jennifer Weiss-Wolf, the author of Periods Gone Public: Taking a Stand For Menstrual Equity and Vice President for Development at NYU Law’s Brennan Center for Justice, has been at the forefront of this legislative and cultural cause since 2015. Here, she speaks to Newest York about advancing the conversation and freeing ourselves of stigma. What is menstrual equity and why do we need to know about it? The concept of menstrual equity is very much a policy-focused frame. It's addressing the idea that menstruation is something experienced by a good half of the population, and in order for that half of the population to be able to participate fully, fairly, and completely in our society – whether it's through the ability to attend school, to be productive at school or at work, or to achieve economic empowerment – we have to include the ability to manage menstruation. What I discovered, which was my call to this movement, is that surprisingly to many of us, it's not as easy as it sounds. Managing menstruation has proven to be too expensive for some people, and the ability to access menstrual products in a way that aligns with how they use them and need them is out of reach. I think that people are surprised to learn that that's the case here in the United States – they're skeptical too – and so part of this agenda has included trying to elevate the stories of people for whom this is their reality. I think people here tend to think that it's a problem that exists in other corners of the world that are less “advanced” – our sort of first-world American exceptionalism – but part of my goal is to demonstrate that the issue does exist here in the United States. Framing the problem as an issue of equity and equitable participation, versus the many other ways it could and has been framed in global initiatives to address menstruation – as a public health issue, a water and sanitation issue, or a human rights issue – was the ticket to advancing a policy agenda that would result in laws that improve the lives and realities of people who menstruate. What have been the greatest successes in the fight so far? New York City can claim one of the biggest and most impactful legislative victories that's proven to be a catalyst for social, legal, and policy change around the country and the world. As I thought about what that agenda would look like, I came up with two ways of getting this idea of menstrual equity into the legislative discourse that seemed most likely to produce results. One was the issue of sales tax on menstrual products, a.k.a. the tampon tax, because it provided a platform that was simple. It wasn't too challenging of an argument to make, nor was it a very challenging solution to forge: states could easily change their tax code to exempt menstrual products from sales tax if they weren't currently, and at the time that the campaign launched, 40 of the 50 states were not exempting menstrual products from sales tax. It was also an argument that was being made in other parts of the world. Canada managed to eliminate its national sales tax on menstrual products in the summer of 2015, and it's been a very public fight in the U.K. and other parts of Europe, India, Australia, and in countries in Africa. It seemed that in bringing it to the United States, there was a good landscape. We weren't the only place that would be having this discussion. But it also seemed to me to be a way to test and put a baby toe into the pool for legislators to even talk about menstruation and the economics of menstruation in a policy context. It was less threatening maybe than talking about what it would mean to serve the needs of people who are most vulnerable, where that creates all kinds of other issues, polarization, and stereotypes. So in the fall of 2015, I put [forward] a petition that Cosmopolitan co-sponsored, and in the 2016 legislative session, states started introducing bills. In just two years, in the 2016 and 2017 legislative sessions, 24 states introduced bills and four actually got it done – New York State being one of them, but Illinois, Connecticut, and Florida did as well. It's very much worth noting that Illinois' and Florida's bills were both signed into law by Republican governors; this issue has absolutely taken on a bipartisan sheen and there's interest and commitment to it from across the aisle, which is wonderful and fascinating all at once. The other idea was what I call access bills, meaning that access to these products for free is really what particularly vulnerable populations need. No sales tax isn't going to change the fact that these items aren't affordable to or accessible by certain populations at all. I always assumed that the tampon tax was the way to test the grounds and ease legislators into a bigger solution, but New York City got out ahead of the tax question in fact, and then those two campaigns were unfolding simultaneously in 2015. New York City was so receptive to this that by the summer of 2016, a package of laws were passed here and signed by the Mayor that mandate free menstrual products in all of the city's public schools, shelters, and correctional facilities. That was really the first legal action of its kind in the world that was as focused on the idea of menstrual equity. I've persuaded people that this phrase and this frame is a good one to use, so that's how these bills were promoted, packaged, and discussed. But really, no other government in the world had taken it head-on in affecting that cross-section of the population, so New York City to me is the gold star. The laws aren't perfect, and implementation is more challenging than passage as it's turned out, but New York City is very committed to this agenda and really set the stage for other big cities and states, and even at the federal level, for this issue to be addressed. It's very heartening to hear about all of these successes. Yeah – it's radical, actually. When I finished writing the book in the summer of 2017, and it was published last fall in October 2017, people would ask what the hardest part about talking about the issue was. And I said, "Talking about periods and menstruation is not hard for me at all." But what became really hard or scary was this shift from the fall of 2016 to 2017 and now with the election and this administration. The battles that we have to fight are so tremendous and the threats are so overwhelming. I thought, "Who’s going to care about this agenda? We had so much wind in our sails, so much traction, and now it's going to completely fall by the wayside, because who really cares about the tampon tax when our entire democracy is at stake?" What I found is that's not really the case at all. This is actually the heart of what we're fighting against, this distrust and disdain for women and our bodies and our experiences and our stories. Nowhere has it been more clear than in the emergence and explosion of the #MeToo movement, Time’s Up, and the Women's Marches – all the ways we're claiming and demanding that our stories and realities be exposed, understood, elevated, and acted upon. It’s different and empowering, and periods are so much a part of that. They're another piece of our lives that are completely normal yet we've been trained and conditioned to think it's completely off-limits, which is part of why the plight of people for whom managing menstruation – whether it's because of their economic status, health, education, or opportunities – has been compromised. That's a real thing, and it's time to demand that all aspects of our lives be treated with the respect and consideration they deserve. We're not a special interest; we're not an exception to the rule. Our bodies are the rule. Having periods is as normal as not having periods. Why is it that it's considered a favor to be asking for menstrual products and not toilet paper when our bodies are the norm as much as anybody's? In talking about shame around women's bodies, especially first periods, I wonder how you would like to see this conversation carry over into the education of young people. That's such an important aspect of this, and what we're seeing now as part of the new reality of American politics is the power of young voices. They're not forced into the box that we’re trained to live in as adults. I do think that educating people from a young age about menstruation in ways that are more affirming, empowering, honest, and explicit will lead to a culture, community, and policy that doesn't marginalize menstruation or ignore it. There's a whole section in the book where I propose some ideas; they aren't tested, and I'm not an educator myself, these are just the ideas of an activist and reasonably smart person who speaks about menstruation and ways to better equip the next generation so that there’s less stigma. There are a lot of ways we can easily normalize menstruation, whether it’s ensuring that menstrual products are freely available to kids who need them, that they're in restrooms and not just in nurse's offices, which implies illness. As a pragmatic matter it's also harder for kids to maneuver and interact with a nurse and the humans in that office, when one can just go the bathroom and take care of their healthy bodily needs. But it's more than just managing periods themselves; it's how we talk about them and it's when we talk about them. They don't just have to be talked about in health class or in a “how you manage yourself” way; they can be part of a discussion of literature, math, science, religion, history, and current events. It infuses everything, and by treating it as a normal piece of regular life versus this special thing we stake out one or two days a year to talk about is another way to do that. I don't know that all of these things will lead to giant seismic generational change, but certainly what we're doing right now is just recreating the same stigma – even if stigma is a harsh word for it. I talked to a high school this week, and the kids were talking about stigma, and they said, "It's not like we believe in all of those tales and superstitions.” But you still don't really feel like you're just going to go up to anyone and talk about periods. I'm not saying you have to do that all the time, but an environment where people aren't afraid to is a healthier environment. Even if that shame is not actively on your mind, I was thinking about it when I brought your book on the train – if I would get looks for the fact that I'm reading a book about periods. And the cover was obviously chosen to be quite loud, and to have people read it on the subway and not make other people uncomfortable, but intrigue them or make them check their discomfort. Why would that make me uncomfortable? It does, but why should it? People ask me all the time as well what's it like to talk to whole legislatures, and male legislators, about the issue? Is it intimidating? Is it embarrassing? And I always say it's the exact opposite. If I'm talking to any individual or group who are uncomfortable about this, I use their discomfort to my advantage. Whatever pause or space they create to catch their own discomfort, I use to immediately set the tone for how we're going to talk about this: the vocabulary that we're going use, the confidence that we're going to use. I don't shy away from it. I don't make them feel uncomfortable or embarrassed for their discomfort, but I let them know that there's no place for it. No one's ever shriveled up and died because they had to talk about it. [laughs] They all get over it within a couple of minutes, and I think their lives are improved for having done it, quite frankly. It's everyone else's chance to shed their discomfort, and if they can't, they really do look foolish. Like, come on. What kind of adult shouldn't be able to talk about this? This is from whence they all come. Haley Weiss (@haleyfweiss) is a contributing editor and associate publisher of Newest York. She lives in Brooklyn and wishes she had a dog.